At the Singapore zoo we saw orangutangs – they had an open cage. 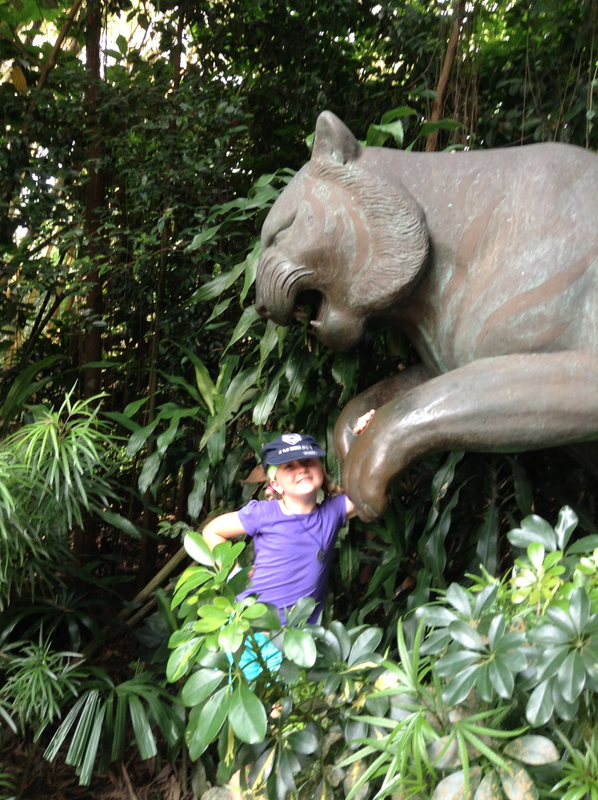 Yasi nearly stepped in their poo because they could go on trees over the paths of the zoo. There was a famous orangutang who had more than 4000 people come to its funeral. 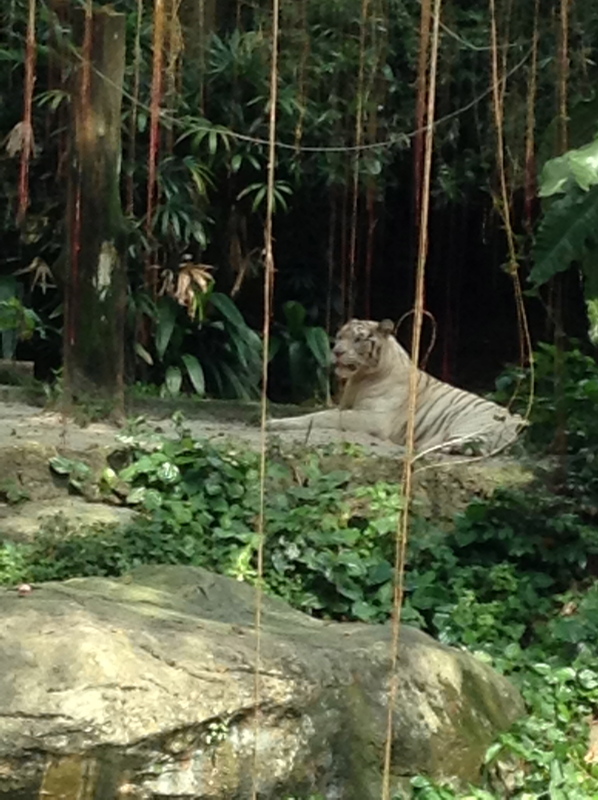 We also saw a white tiger – they are very rare. When we went to an elephant show they squirted us with their trunks. At the kids area we saw an ‘Animals and friends’ show. There was a watch in the cupboard and the dog found it. We could go up and pat the dogs at the end. The dogs were given to a lost dog home to be put down because the owners thought they were ugly and un-trainable. They were actually really cute, and the zoo keepers said that with patience and love anything is possible. We went on a night tour in a zebra train and saw lots of nocturnal animals like hyenas and owls. The person who talked on the tour asked me my favourite animal – a horse of course! It was her favourite animal too. We stayed at the Lost Garden Guest house in Kunming for 3 days. My first impression was so much spicy food – impossible to find non spicy food. There are lost of nice things to buy in the shops even live fish and turtles and frogs and crabs. I got some new river shoes cause I lost my sandals. On the fourth day Alex picked us up to take us to the stone forest. Alex was our tour guide and was very nice. We found lots of interesting rocks. One was like a pipe with the top chopped off. I climbed on a rock that went straight up in 3.2 seconds – Toby timed me. It was about 1 and 1/2 metres tall. Alex took us to a huge Restaurant for dinner. There was a big circle in the middle with ponds and bird cages and fish and birds. Two fish waved to us with their fins when we stopped there. There was so much food – some spicy some not- most of it was yummy. We drove to the train station and went on an overnight train to Dali. There were little rooms with beds and we couldn’t fit our luggage we had to out some on the floor and beds. Yeshi – our guide from Back Roads of China picked us up for the start of our tour. First when we spotted him I didn’t know which one was him cause there were hundreds of people and it was 6am in the morning.